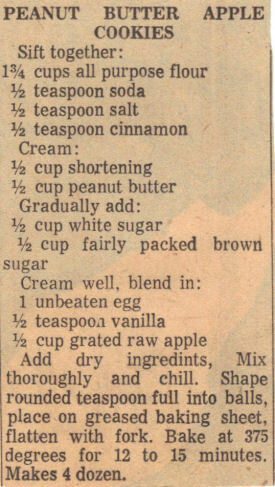 This vintage recipe was clipped from a newspaper and found in a large collection, date unknown. I’ve typed it below along with a scanned copy. Add dry ingredients, mix thoroughly and chill. Shape rounded teaspoon full into balls, place on greased baking sheet, flatten with fork. Bake at 375 degrees for 12 to 15 minutes. Makes 4 dozen.